Whether you're a General Contractor needing excavation and accurate placement of footings, foundations and slabs for your next addition or a Home Builder needing a quality conscious, dependable flatwork contractor for your new subdivision, Volpone Constructions experienced, capable crews can help. 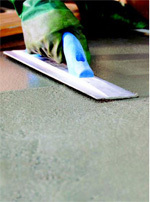 We have expertise and years of experience in all areas of concrete maintenance. Whether you manage Residential, Commercial, Office Complex's or Retail Centers, Volpone Construction can help with all of your concrete needs.